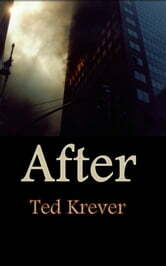 After is a collection of short stories written in the post 9/11 era. They include, among others, a man masquerading in firefighter’s gear in order to get laid, a network news anchor fretting that his network is the only one not to receive an anthrax threat, a woman who rented an apartment to one of the 9/11 hijackers and a passenger’s widow confronted the next day by a confused, upset man at her doorstep, covered in chalky dust and carrying her husband’s wallet. ‘After’ includes immediate reactions to the 9/11 attacks (the story ‘After’ was written November 9, 2001)-and some fairly recent views as well (‘Red Sky’ was written in March 2009). I remember sending ‘After’ out to magazines at the time and getting responses that it was a little raw for the political environment of the time. Looking back now, I don’t think I was that far off.